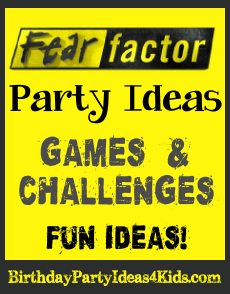 Fear Factor Party ideas for kids including birthday party ideas for Fear Factor birthday invitations, party challenges, decorations, games, food, party favors and goody / loot bags. Great bday party ideas for boys and girls, kids, tweens and teens ages 5, 6, 7, 8, 9, 10, 11, 12, 13, 14, 15, 16, 17 years old. Yellow or Black blank cards - write or print out "Is Fear a Factor For YOU?" in the opposite color on the front or inside of the card. 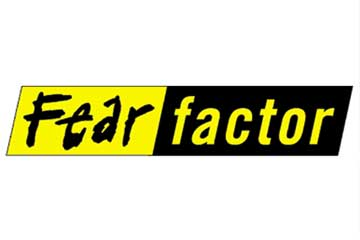 Print out a copy of the Fear Factor Logo and paste to blank cards. Make your invitations smaller and attach with a string to a plastic snake. Find "Caution" black and yellow tape and glue in strips to the front of a blank card. You can also cut the edges of the invitation with scrapbooking scissors for an edge that looks like a saw blade. Wrap the mailbox with "Danger" or "Warning" tape and add a few black and yellow helium balloons so guests will know where the party is located. Wrap trees, bushes and walkways with "Warning" tape so the guests have to zigzag to get to the entrance. Along the driveway or walkway place chalk outlines of bodies ... they can be human, animal or cartoon characters for fun. Make a large poster with black and yellow paint that reads "Is Fear a Factor for YOU?" and tape to the party door. Decorate party tables with a yellow tablecloth and black plates, cups, napkins and flatware (or vice versa). Crisscross the yellow and black warning tape across the table. Hang black and yellow balloons with streamers or black and yellow tulle. Around the top of the table place plastic spiders, snakes and bugs. In small glass jars place candy gummy worms so that they are spilling out of the jar. Use cotton batting for spider webs and and Halloween decorations that you can find. Keep the party room dim and hang up strings of yellow or purple lights. Rent a fog machine for a great creepy effect. Or cover one half of the tables in black and the other half in yellow to look like the Fear Factor logo. Then use yellow plates, cups and napkins on the black side and black plates on the yellow side. *Instead of eliminating party guests use a point system to allow them to compete in all the games. 1 point for trying the challenge, 1 point for finishing and 1 point for the fastest time. At the end of the party tally the points and award prizes to the top 3. Guests must blindly choose 3 cards with different food items on them, mix them and then eat the mixture. Before the party gather different food items such as catsup, mustard, pickle relish, chocolate syrup, various baby foods (prunes, green beans, peas, etc. ), canned beets, etc. - then write the name of the food on an index card (one food per card). At the party lay the cards face down on a table and have one guest at a time pick 3 cards. Take a tablespoon of each ingredient the guest chose, blend it or mix it in a small bowl and then place it in a small disposable Dixie cup for them to eat. Fill a small plastic kiddie pool with water and bags of ice. Inside the pool place plastic spiders, roaches and/or snakes. With their bare feet party guests must try and get as many of the plastic bugs out of the pool within a 30 second time limit. In this challenge party guests will have to roll a dice to determine how many spoonfuls of "dog food" they must eat. Before the party buy several cans of dog food. Open them (but leave the lid attached a little) and remove the dog food from the can then wash and dry the cans. Open several cans of SPAM and spoon it into the clean dog food cans. Shut the cans of dog food and store in the refrigerator. Right before the challenge take the cans out of the refrigerator and pretend to open them with a can opener out of the sight of the guests. One by one have the guests roll the dice to see how many spoonfuls of the SPAM they have to eat. Have an adult use plastic spoons to dip into the SPAM and fill as many spoons as the dice roll. Lay the spoons in front of the guest and have them eat it within a 2 minute time period. This can be played individually or in a team relay. For a team relay set up two containers. Fill a large container with crickets (you can purchase these at a pet store) and then place 7 - 10 sets of keys in the bucket with the crickets. A distance away from the cricket containers have several boxes or trunks that are locked with the locks that go with the keys in the containers. The guests must run to the cricket container, grab a key, and then run back to the locks. All the keys must be gotten before they can come back and try to open all the locks. Fastest time wins. Curled hot dogs (cut hotdogs into four pieces lengthwise and leave 1 inch of the hot dog intact at one end. Rice Krispie treats that are dyed green. Decorate a shirt that says " I survived ________'s birthday party!" A Certificate that says "Fear is not a Factor for ________ (guests name)!" Black or yellow bags with the Fear Factor Logo. Black or yellow bandana to tie around the party favors.